Preparing to host the Wells Fargo Championship, last year's PGA Championship host underwent yet more design modifications on top of modifications made to the previous modifications. The good news: Quail Hollow's green speeds and rough are more subdued this week thanks to a ryegrass overseed and elimination of some teeing grounds from consideration. True to his word, on Tuesday as players made their way around the course to prepare for this week’s event, there was an actual lemonade stand perched on the back of the fourth tee box. George Savaricas reports for Golf Central on player reaction. I enjoyed the nominations by the SI/Golf.com gang in discussing the most underrated and overrated stories from the past year. The most underrated story was Spieth's Open win. In a lifetime of watching golf, I never saw anything like it, and the aftermath — how he and Kuchar handled it — was every bit as good. Sens: I don't know if it was overrated but it got more play than warranted. Four young Tour pros go on a spring break trip together and film themselves yucking it up in the tropics. Sorry, but I couldn't have been more bored. You could take your pick of underrated stories from the women's game, because the women's game rarely gets the attention it deserves. But the ups and downs of Lexi Thompson's season — her run-ins with the rules; her rise up the rankings — have been compelling theater. Passov: I'll nominate Bernhard Langer's performance on the PGA Tour Champions circuit as the most underrated story of the year. He posted 16 top 10s in 22 events with seven wins and three majors — at age 60! A more complicated case of overrated/underrated is raised by Joe Passov in suggesting the Erin Hills criticism was overrated. But I think we are talking about different things here (venue vs. scoring). For overrated, I'll go with the incessant second-guessing and criticism about Erin Hills as a U.S. Open venue. So it played easy. That's what the weather dealt and how the USGA set it up. Honestly, it was a terrific, thought-provoking modern design, whether or not it played precisely like a links. There were no controversies with the greens, except perhaps the tiny, tilted putting surface at the short par-3 9th. I'd agree the second guessing of the scoring is overrated given that in the long term, few will remember the final number posted by Brooks Koepka. Unless...the narrowing at Shinnecock Hills in 2018 was a response to Erin Hills and backfires. Doug Ferguson of the AP again takes on the challenging task of picking the year's best shots by each club in the bag. 6-IRON: The two memorable shots from Jordan Spieth's victory in the British Open were the shot from the driving range and the 50-foot eagle putt. The most important shot was the 6-iron he nearly holed on the par-3 14th. Trailing for the first time in the final round after his adventurous bogey on the previous hole at Royal Birkdale, Spieth's tee shot plopped down in front of the hole and stopped 4 feet away. The birdie tied the lead, and Spieth was on his way. 7-IRON: Justin Thomas took control in the final round of the PGA Championship with a par putt on the 16th. He sealed it with a 7-iron as good as any shot he ever hit. The pin was in the front on the par-3 17th at Quail Hollow, and Thomas had 221 yards over the water to the hole. It was so good that he let the club twirl through his hands as he watched it land on the front of the green to 15 feet. He made birdie for a three-shot lead and a most enjoyable walk to the final hole. Tiger Reviews In: This Was A Sequel Worth Watching! If Tiger were Star Wars then 1997 would be his Episode IV A New Hope, 2000 his Empire Strikes Back and the 2016 World Challenge, in hindsight, his version of stilted Episode 1. First, let's get an hygiene point out of the way before we get to the reviews: Tiger, under no circumstances, should ever sport facial hair of any kind again. No goatees, no fu manchu's, no modified-fu manchu's and certainly no soul patches. Clean shaven for this comeback, the man looked ten years younger! Oh, and he still has no major titles won with any of his assorted growths from over the years, FYI. There are no issues with his surgically repaired back. No issues with his swing speed. No issues with his power. Nope, after a 72-hole romp around Albany Golf Course, there remain few issues ahead for Tiger Woods, few questions as he heads into the new year. Woods made a return to golf that was solid with his health and his game, and he headed into the holidays thinking about a schedule for 2018. Tiger Woods is back – again. The future looks bright for Woods after the 79-time PGA TOUR winner successfully negotiated all four rounds at the Hero World Challenge in his long-awaited comeback from back surgery. Rex Hoggardfocused on the driving effort as a huge sign of success. For four days, Woods drove the ball as well as he has in a decade, putted better than his final statistics might suggest and largely controlled his golf ball with the notable exception of his opening loop on Saturday. For four days, Woods drove it as well he has in 10 years, mostly looked good with the putter and, save for his opening nine on a blustery Saturday, largely controlled his ball. The power he unleashed with his driver -- and some of the other shots he launched into orbit with his 2-iron -- was a remarkable sign of renewal, especially if you understand where he has been since the first of four back surgeries in 2014 and all the struggles he has had keeping the ball in play. Woods had no trouble keeping pace with Thomas, who ranked eighth in driving distance on the PGA Tour in 2017 by averaging nearly 310 yards off the tee. He's been through a personal hell, major surgery, the chip yips and a bunch of other things. He played well and carried himself well and talked like a person who knows there's a mountain in front of him and he's just starting the climb. It was impressive. Karen Crouseis rightfully a little more skeptical after last year's exciting return, followed by another back setup but ends her piece on a positive note, reminding us that Woods no longer needs to carry the sport. That should be a little less burden! His positivity spread some holiday cheer throughout a golf industry that, as evidenced by the PGA Tour’s countdown tweets and the Golf Channel reporters’ breathless commentary, is determined to milk every last drop from its longtime cash cow. Of course, with Woods, any glad tidings come with a caveat: If his surgically fused back is bothering him, it won’t become apparent until much later. Asked on Sunday if he was in any pain, he said he was not. But history suggests that even if he was hurting he would not say so. G.C. Digitalwith key stats from the final round for Woods, including 13/14 fairways. Tiger is projected as high as 659 in next week's World Ranking. This week's 659th-ranked player was Finn Fleer, a German who won on the ProGolf Tour in Poland in September. Here’s what a possible schedule for the season looks like, courtesy ofGolfweek. Oh please don't go to the UAE. Please? Mark Cannizzarotalked toRafa Nadal as the tennis legend walked the course watching Woods for just the second time in person. I know we did this a year ago but much suggests this Hero World Challenge comeback is different. One key crime of the wraparound: not getting to disgest, analyze and celebrate the many fun stats produced by the players and documented by the ShotLink system. Thanks to the crack crew at ShotLink I just started looking over the 2016-17 stats as we roll into week two of 2017-18. Naturally, I went to the distance numbers first and the overall average spiked from last year's 290.0 number. I'm fairly certain the 292.5 yard average for 2016-17 makes it a record year, proving yet again that core work and heavy use of foam rollers can pay dividends. All drives in '16-17 averaged 285.1, but the records do not go back as far to put that number into perspective. Note that 43 players averaged over 300 yards, compared to 27 in 2015-16. That's also a new high mark for 300+ average. Just one player (John Daly) averaged over 300 yards in 2002 when the Statement of Principles was issued. Do I need to keep going? Randall Mell at GolfChannel.com is the first outside of posts here to take on the backstopping matter. With the PGA Tour Player of the Year trying to argue the practice is almost non-existent and it's his right to take advantage of another player's golf ball as a backstop. Anyway, Mell notes that a Rules of Golf does cover this issue in the Decisions two ways, with the latter requiring, the players admit intent. What is still not addressed in any of this discussion is the obvious thumbing of noses to the spirit of the rules, something that has left many long time elite players aghast watching the practice evolve. But if the spirit of the rules angle doesn't impact today's young players, maybe the dollar figure side will. Finau took home $669,000 for finishing second on Sunday. Phil Mickelson and Chesson Hadley finished a shot behind Finau and took home $359,600 for sharing third place. If Finau had not saved par at the 12th and fallen into a three-way tie for second, he would have taken home $462,933, as would Mickelson and Hadley. That matters, and so do the FedExCup points at stake. Mell says the PGA Tour cannot wait for the governing bodies to address something that imperils the integrity of the tour when it's trying to make sure it has all integrity ducks in a row. The PGA Tour’s administration ought to step in, too, to address whether Thomas is right in his thinking, or whether there is more for players to consider. Fans should know whether the PGA Tour deems Thomas is correct in asserting he has “a right” to play quickly. This isn’t about trying to craft specific language for a new rule. It’s about examining hearts and creating awareness about the importance of even the appearance of impropriety. There’s no definitive solution here, but if the Tour’s going to implement an integrity program to protect itself from gambling issues, then framing backstopping issues for players that will reduce the possibilities they become a powder keg some Sunday soon is worth flushing out. Video: Mickelson Says "Let's Take A Moment To Admire That I Just Hit A Fairway"
Fun stuff in the final round at Safeway Open, where Mickelson hit 15 of 56 fairways, though as he noted post-round as captured by PGATour.com's Mike McAllister, some are as narrow as 13 yards in spots. During Sunday's Safeway Open final round we had yet another example of the backstopping practice prevalent only in men's professional golf (here, here and here for 2017 samples). In case you haven't been watching, this is the now-regular practice where golf balls are left down on a green unless it's in the path to the hole, with various motives and theories as to why this has become practice instead of players simply marking their ball to protect the field. Speed of play is cited as the reasoning. 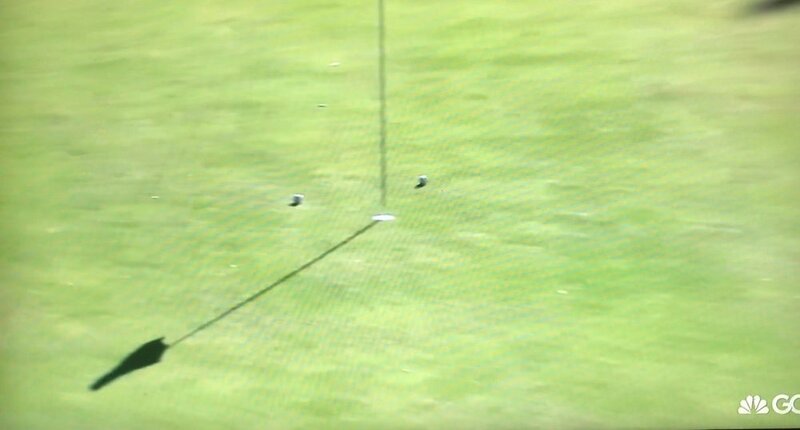 As Will Gray points out here for GolfChannel.com, Tony Finau was likely saved a shot during the 2017 Safeway Open final round when he had a buried lie with playing partner Jason Kokrak's 34-yard wedge shot was near the cup. In a post round interview with George Savaricus, Finau said he'd forgotten Kokrak's ball was by the hole when he hit. "Funny thing is, I forgot he hit. I was so focused on what I needed to do and how hard my shot was," Finau said. "I hit a perfect shot, but it was still going to go about 25-30 feet past. It was a bonus to hit his ball. I used the rules to my advantage, I guess, not knowing." Finau finished second, one ahead of Phil Mickelson and two behind winner Brendan Steele. Here is the shot that elicited a response from PGA Tour Player of the Year Justin Thomas. In responding to Gray, Thomas said the practice of playing with a ball down by the hole happens "MAYBE" five times a year and is "part of the game, if I want to rush and hit a shot for that reason, it's my right." So to recap: the player of the year says it's his right to rush a shot before a player can mark it, to gain an advantage that happens maybe five times a year. There you have it! The implication of Thomas' second tweet is unclear to me. He retweeted a fan's thought related to grandstands and spectators that suggests he views this as a rub of the green matter, even while believing it's his right to take advantage of a competitor's ball on the green. Somewhere Bobby Jones is harumphing at this admission. The Rules allow a tournament committee to disqualify a player if they determined "players have agreed not to lift a ball that might assist any competitor." Thomas also suggested the players are often too far away to mark a ball in time and this is why the practice occurs...five times a year, "MAYBE". Half the time in these cases--that's MAYBE 2.5 times a year in Thomas's thinking--the walking distance is apparently too great for a player to wait, as Thomas demonstrated on the final day at TPC Boston earlier this season when Marc Leishman chipped up to the sixth hole and Thomas played quickly to enjoy what we now know was a hoped-for advantage. But if we take the Kokrak-Finau example at Safeway, it would require an extra 20-22 seconds to have walked the 34 yards to slap a coin down before Finau played. Since Finau forgot Kokrak had hit, this wasn't possible. I'm not sure how you forget that a playing partner hit a shot, but alas, this is the situation. Thomas believes too much attention is being paid to the subject, but prominent others are not agreeing. While many don't see this practice as a major issue, I do not agree for the very simple reason that professional golf's success is built on the integrity of its players. Corporations pay handsomely to be part of professional golf because they view the athletes as the most honest and upstanding in all of sports. Many fans follow the sport and love it because the athletes have such integrity. Having a top player openly confessing to taking advantage of a ball on the green to possibly better his chances of finishing near the hole, is not great. If we found that his peers knows he does this and leave the occasional ball down to help him, we'd have the makings of disqualification for violating the rules. That this is even a "thing" speaks to a cultural shift and behavior that, if it becomes commonplace, could cause some to question the integrity of the players. Or, at the very least, make fans question if the players are legitimiately competing or colluding for peculiar reasons. Besides, play can be sped up in much better ways than this. Words I never imagined typing! But given the visuals, the views, the atmosphere, the event buzz in New York City and what sounded like a solid fan experience, Liberty National worked as the Presidents Cup venue. Several people at the PGA Tour deserve credit for making the golf course and incredible site build-out work so well, as noted in my assessment for Golfweek. Mmatch play can make the edgier or more abrasive features more palatable than when players confront them in stroke play, and that happened at the Presidents Cup. Also helping is that Bob Cupp and Tom Kite's design as adjusted by the PGA Tour's Steve Wenzloff, it's severely over constructed and quite possibly the most-catch basin-littered property in golf. And you know how I love the architectural influence of catch basins. Liberty National next hosts the 2019 Northern Trust playoff event. 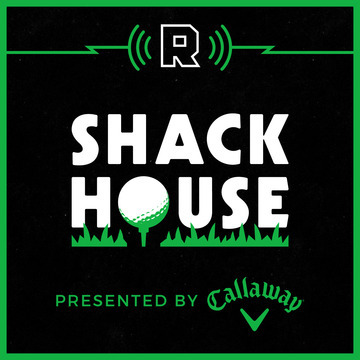 ShackHouse 49: Presidents Cup And PGA Tour Season Review! House and I are back to preview the Presidents Cup and hand out some juicy predictions...well decent bets, plus why you should care about the event. We also kick around the FedExCup conclusion and World Golf Hall of Fame's issues getting noticed. As always, you can subscribe on iTunes and or just refresh your device's podcast subscription page. Here is The Ringer's show page. Same deal with Art19 for the show, and Episode 49 is here to listen to right now. Or this new platform or wherever podcasts are streamed. ShackHouse is brought to you by Callaway, and of course, the new Steelhead fairway woods along with the new O-Works from Odyssey as well. Let's hope this was the second-to-last FedExCup final of its kind as the confusion over who might win the Cup with each birdie, bogey and blunder was not particularly as interesting as the Tour Championship conclusion. By having an algorithm-driven competition juxtaposed with a real-time golf tournament playing out, Commissioner Jay Monahan now has a dream scenario to point at for separating the conclusions in 2019's schedule remastering. The silliness of it trying to figure it all out does not take away from the incredible accomplishments of Tour Championship winner Xander Schauffele or FedExCup winner Justin Thomas. Both capped off breakthrough seasons of differing types. While Steve Hummer is right in his AJC game story that there was a little bit of something for everyone, the average sports fan and the above-average corporate sponsor paying to be part of this spectacle could not be blamed for wanting a more clever conclusion to the season. Rex Hoggard at GolfChannel.com explains a dream scenario that almost arose but failed to do so because of bit players in the drama. If Koepka was the one who tempted us with a possible $10 million showdown between Spieth and Thomas, it was Kevin Kisner’s birdie at the sixth to temporarily move into the lead by himself that propelled Spieth into the projected points hot seat. Forty-five minutes later, it was Tony Finau’s birdie to close his week that prompted an equally dramatic flip, with Thomas moving into the top spot. A game that invests so much in individual accomplishments turns into a crowd-sourcing experiment at the circuit’s big finish, and it was no surprise that it was the play of those on the periphery that had such an influence on the outcome. Thomas discussed the oddity of trying to win a title without knowing where you stand and as Brian Wacker notes in this Golf World item, the final round offered supporting reminders as to why the playoffs need work. “I knew if I won, finished second, maybe tied second I probably had a good chance depending on what Jordan did today, but I truly didn’t know,” he said. “It is weird just because I compared it earlier to Q school … you almost get out there not trying to win, you’re trying to finish a certain thing. Jeff Babineau at Golfweek on another big day for the Class of 2011. Will Gray with notes and best of moments from the final day. The final FedExCup standings and bonuses. 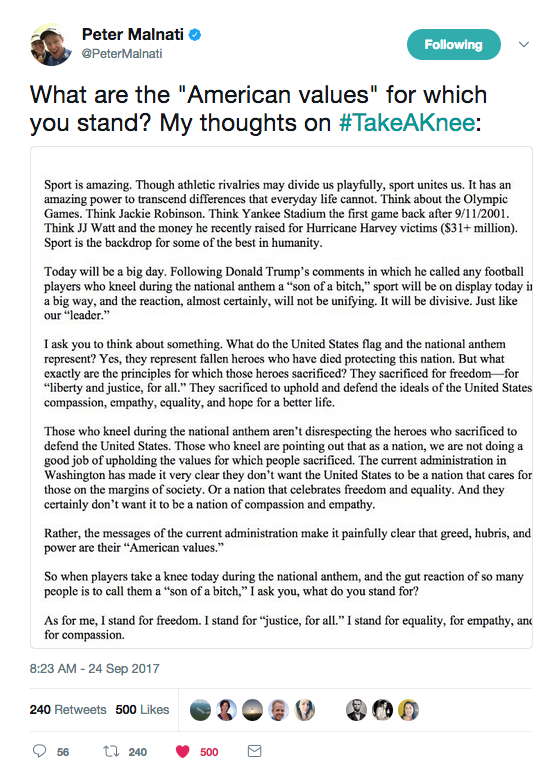 Fourth year PGA Tour player and blogger Peter Malnati took to Twitter with more than 140 characters to express his support for fellow professional athletes "taking a knee" during the national anthem. Casey Leads, Kisner Copters Out: Another FedExCup Is (Mercifully) About To End! Outside of player accountants, I know almost none of you will have the live updated FedExCup standings page open during Sunday's Tour Championship finale at East Lake. That's because the competition you hate having to explain to inquisitive friends is about to wrap another year of...promoted pieces telling us how great the FedExCup is. At least something that might make more sense--splitting the Tour Championship from a FedExCup final day--is in the works pending player input. Until then, we'll be held hostage to the algorithms, which makes explaining scenarios very tough sledding (Wacker/GolfDigest.com). At least this year there was the fun of Kevin Kisner helicoptering out of Atlanta to watch his beloved Georgia Bulldogs to remind us where most sports fans would rather be (DiMeglio/USA Today). Kisner Tweeted a photo and credited Justin Thomas for helping him find the ride (Hoggard/Golfweek). At least there is Xander Schauffele emerging as a big time player almost out of nowhere, including after a terrible start to the season. (Babineau/Golfweek). At least Justin Thomas doesn't care where he stands when the numbers crunchers tried to inform of his Sunday scenarios (Babineau/Golfweek). And at least there is Paul Casey to root for, who has played spectacularly in "playoff" events without winning (Everill/PGATour.com) and whose track record in final rounds does not match his talent (Murray/Guardian). Points leader Jordan Spieth is feeling mostly powerless in the chase for the Cup after a third round 69 (Hoggard/GolfChannel.com). Besides explaining what the putter with 8 degrees of loft meant to Jones, Wall's piece includes a fun Q&A with Jones historian Sid Matthew at the end. Jones eventually walked away from competition at 28, on the heels of his historic victory at the 1930 U.S. Open that completed the then-Grand Slam that also included wins that year at the U.S. and British Amateurs and the Open Championship. In the years that followed, Calamity Jane would fade into the distance, but from time to time, Jones would reunite with his old friend and the sparks would fly. As golf writer Bill Fields noted in a Golf Digest story on the famed putter, Jones brought the putter out of retirement at the 1936 Masters and promptly shot 64 at Augusta National with just 25 putts. "It's just like an old friend now," Jones told The New York Times back then. "The ball kept going up to the cup and acting as though it had eyes." "Absent Friend Casts a Shadow Over a Rookie’s Tour Milestone"
The New York Times' Karen Crouse revisits the story of Patrick Cantlay and the friend/caddy he lost in Chris Roth, but there's an added dimension to Cantlay reaching the Tour Championship Sunday. Crouse writes of Roth's parents trailing along in the gallery. I've heard from a few of you who were not sure what took 20 minutes for Sergio Garcia to get a ruling at the 2017 BMW Championship's last hole. In a nutshell: with a playoff spot at East Lake on the line--the pressure!--Garcia's ball in the hazard could be played except for the movable (grandstand) obstruction. Will Gray's GolfChannel.com report explains the issues involved, in particular the difference between a movable and immovable obstruction for a ball in the hazard, with insights from the official on the scene, Stephen Cox. While Rule 24-2 does not allow a player to take relief from a movable obstruction when in a hazard, Cox explained that the temporary nature of the obstruction made Garcia eligible to receive a free drop, provided he remained inside the hazard. An Incredible Decade Of Rory Winds Down With Winless Season And Fulfillment Of "Expectations Elsewhere"
The Daily Mail's Derek Lawrenson writes on the 10-year anniversary of Rory McIlroy's decision to turn pro and says "if the last decade has shown us anything, it is there's nothing in golf quite like the sight of McIlroy in full flow." Suggesting McIlroy's first decade fell short only to those of Palmer, Nicklaus, Woods and Ballesteros, Lawrenson wonders what will happen to turn things around. McIlroy has certainly got some serious issues to address, beginning with his health. We're told the persistent rib injury that has prevented him from practising properly for much of this season will be put right with two months of rest and we can only hope this proves the case. While he's doing that in October and November McIlroy will begin the search for a new caddie, and you only have to look at the contribution Michael Greller makes to Spieth's success to illustrate the importance of the right choice. On the course, McIlroy might have few peers when it comes to his work off the tee but it's not much use when it's accompanied by stats showing his wedge game and putting are way below a level to allow him to take advantage. The plan is to spend much of December working on a solution. One of the more interesting comments from McIlroy at the BMW Championship was reported by GolfChannel.com's Will Gray. Discussing why he played the PGA Tour Playoffs after suggesting he might pass to rest a nagging rib injury, McIlroy said he ultimately played at someone else's request. While he explained that playing the last three events hasn’t made any further impact on his existing injury, he also hinted that the decision to tackle the playoffs was not entirely his. McIlroy became a free agent of sorts when Nike exited the equipment business but signed with Taylor Made mid-season. Whether it was one of those two companies or the PGA Tour pressuring McIlroy to play despite his health issues, is not clear. But given the potential for harm, the resulting mediocre playoff run and the loads of potential McIlroy possesses to be a dominant player, it sounds like priority number one is getting some of his obligations in better order heading into 2018. In light of the recent brouhaha over player comments at TPC Boston's forced layup that caused driver-hugging players to go down another fairway, Jaime Diaz concludes for Golf World that recent distance gains are going to keep leading to more setup and design dramas. He says the big picture of recent course setup issues suggests "a day of reckoning is coming." Much of that conclusion is based on this disheartening news out of Southampton. Next year the U.S. Open is going to a Golden Age classic, Shinnecock Hills, artful in the extreme, but also shortish. It’s the kind of venue that is most at risk of being overrun by the modern game. In the last few years, Bill Coore and Ben Crenshaw restored the course. The fairways were widened (up to 60 yards), the greens expanded, and trees were removed. Visually, the result was spectacular, and the club’s members have loved the changes. The USGA, too, initially sang the restoration’s praises, but recently officials have reconsidered their original setup plans at Shinnecock. The fairway width—done to create more strategic angles and options—was deemed too wide (perhaps in the wake of Erin Hills). Native fescue rough is now being planted on the edges of the fairway to narrow them back down. The course won’t be as narrow as it was when it held the championship in 1986, 1995 and 2004, but it will be narrower than what was originally planned on for 2018. So that the art of Shinnecock can be brought out rather than overrun, the decision was made that long and crooked has to be punished. In an odd way I wonder if such a high profile change to such a high profile course this late in the game is being implemented with the full knowledge that this reinforces the need for a variable distance ball? Here's the fun thing about this bizarro trend of men's professional golfers leaving their chip shots around the hole, all in the name of slow play: they are getting more brazen. Even better, this is going to help us bring back the stymie! The backstopping/sideboarding practice of leaving your ball down--in the name of speeding up play of course--used to be something that only happened in lower profile situations. Increasingly though big name players in big name pairings have been so eager to speed up play, they are willing to not protect the field by leaving their ball in a place that might help their fellow PGA Tour brother competitor. Of course to do so knowingly results in disqualification under the Rules. And for those who say it doesn't happen, may I refresh your memories here. The practice, which only seems to be happening in men's pro golf, is also continuing in Europe. This was Saturday and an all timer given the proximity of the playing partners who just couldn't take that extra 7 seconds to mark their ball. Here's the bad news: as this strange, buddy-buddy, backscratching practice picks up steam, someone will stand fifteen feet from his ball, watch his ball get hit by another player who then makes par instead of bogey. That player will ends up winning a tournament by a shot or costing someone his card and will be publicly shamed. His reputation might even be ruined. And all for just doing what everyone does every day on the tour because that's how they play the game out there. And play will still be slow. This practice might be cutting 20-30 seconds a round. Yet guys will still mark 18 inchers to not step in a through line, but they'll leave their ball down 18 inches from the hole to help out a buddy who might help them later in the round. I know shining a light on suspect behavior is upsetting for many in a sport where the players are generally the most honest and upstanding in all of sports. But as a clubby sport by nature that values protecting those who have joined the gang, suggests image of those who stick together over good, old-fashioned competition. As a sport, if fans sense the players are just playing week to week hoping for their shot and helping their buddies out at other times, pro golf will ultimately lose a certain edge and purity if a practice like this continues. Oh, and there is also the "what other rules are they bending" question that is so dangerous to a sport's reputation. 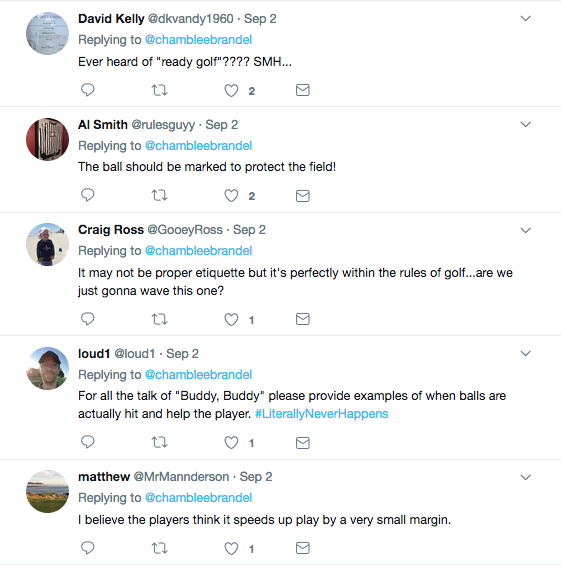 Brandel Chamblee engaged with readers on the topic Saturday after the above incident. The original questioner deleted his question, but it's a nice mix of those who see this for what it is (some bizarre tacit agreement that has festered) and those who believe the guys just are trying to speed things up.